It was especially excited to be included in “Looking at Music: Side 2” (below) which featured the NY punk era with the FT video placed as the first thing you see as you walk in, and was surrounded by objects related to Patti Smith, Richard Hell and Television… the Founding Fathers & Mother:) For NY punk, it doesn’t get better than that. Before my main YouTube account was closed in 2010, FT had 100k views and many links to it. I reposted it to a new YT account but all that momentum has been lost. That’s how the YouTube cookie crumbles. I’ve redoubling my efforts to get the account reinstated with pro bono legal help, more on that later. Here’s a sampling of the comments (there were several hundred), this gives you the idea. There were lots of put-downs the positive/negative was about 50/50. I esp, like the last comment. DibsWife can someone please tell me what this is suposed to tell me? i’m not getting this. how did this get to be one of the creepiest songs. 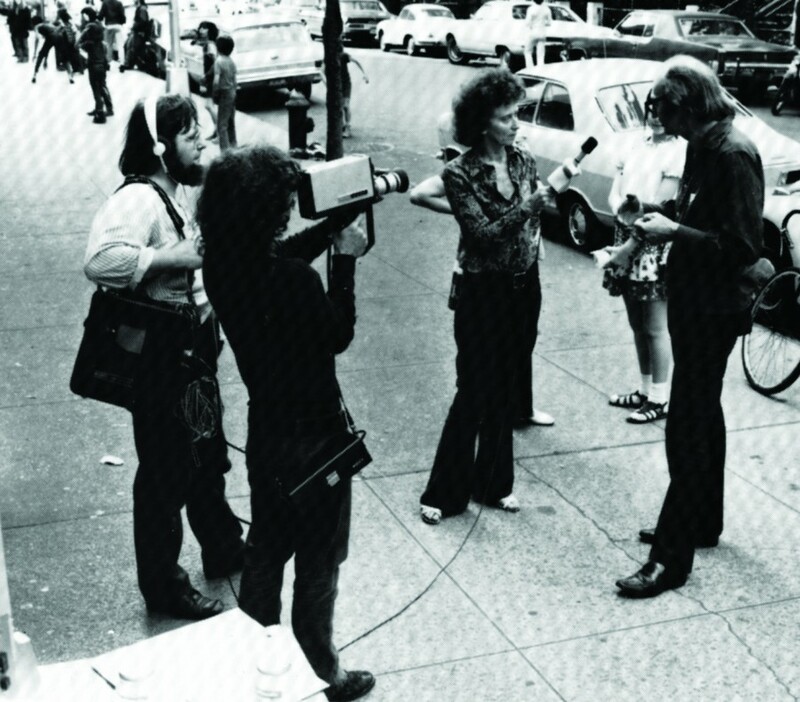 This is the history of the video – while working on the Synapse Visiting Artists Program at Syracuse University in 1975 I met artist Jaime Davidovich during his residency there. I moved back to NYC in 1976 and helped Jaime with his efforts to launch Cable Soho. He introduced me to artists Edit deAk & Walter Robinson in 1977. They lived across the street in a great big loft near the corner of Houston and Wooster. 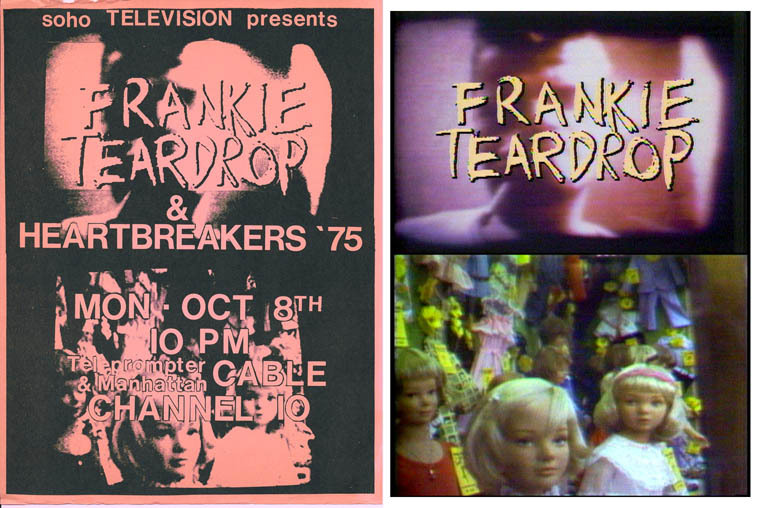 Edit and Walter worked up a film for the Suicide song Frankie Teardrop that was played/performed “live” with several Super 8 projectors to a record’s playback. A central aspect was the overlapping pf projections. Then they often re-filming the superimpositions. That then resulted in a (re-filmed) composite that could be introduced back into the real-time projected mix. I saw them stage this multi-projector version in their loft. 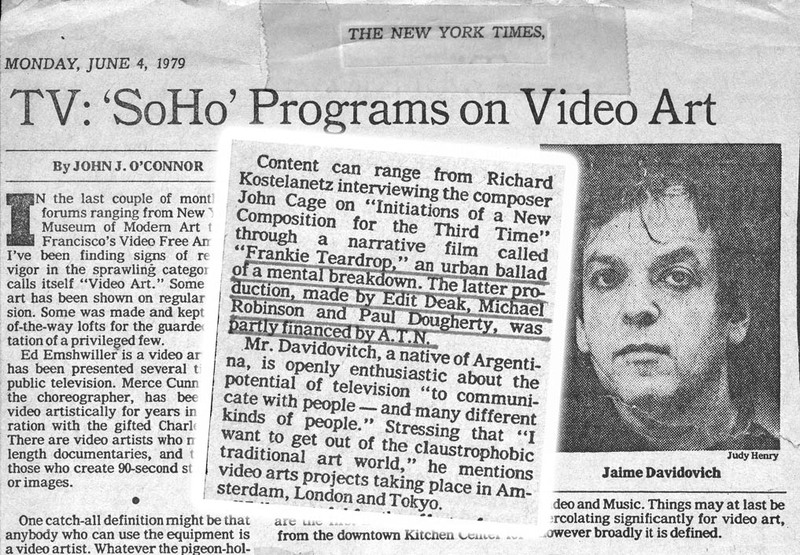 Jaime was interested in getting FT made into a videotape he could cablecast on his Cable Soho program and so he introduced me to them, knowing I liked this kind of music. I was excited about the project and wanted to get involved. Since I worked on staff at a world-class editing facility, I knew I could bring a lot to getting this made into a video. Besides transferring the Super-8 to video, I felt like we needed more footage to flesh out this 10+ min. song. I borrowed their Super-8 camera and shot some more in Queens and the Wall Street area. I also borrowed a video camera and went with Walter to Queens to shoot some additional video in an industrial area where I used to work. Next I went back to Syracuse to transfer to the film to 2″ tape c/o Synapse Visiting Artists Program. My boss (in NYC) gave his blessing to do personal projects at the video facility as a way to practice my editing (in this case learning CMX the original computer timecode editing system). The understanding was that I would do this discreetly at odd hours so as not to provoke interest or controversy. I did the editing alone, but tried to honor key elements of the FT original film structure. I would meet with Walter and Edit to review the progress by screening 3/4 tapes. One of the key differences between the ‘live’ film and the resulting video came with refined sync with music so that images and transitions could land on precise music cues. This new (1977) edit room also made it easy to do dissolves and superimpositions that at that time were financially out of reach to video artists ($400ph in 1977 dollars!!) The other thing that was even more out of teach was slow-motion, easy with Super 8 by adjusting projector speed but in video even more rarefied than dissolves. 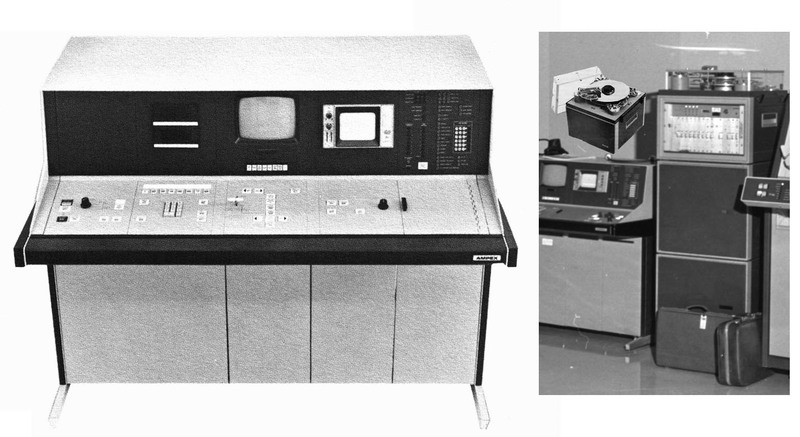 In the days of 2″ Quad videotape, there was no tape slo-mo, it required a Ampex disc recorder that was primarily the domain of sports slo-mo replays and extremely rare in edit rooms. Get a load of this Monster below:) To the right of the waveform monitor is a patch-panel for analog computer programming! There was a hiatus between our finishing FT (early 1978) and it premiering on Cable Soho. It ran in 1979 and my friend Steve Latham designed the handbill poster and I think help me plaster it around town. Since Jaime had a 30 min program slot I volunteered a Heartbreakers (with Richard Hell) performance video (1975) as a complimentary segment. I had directed this video (switching the 3 cameras) as part of the Metropolis Video gang that shot some of the early performances at CBGBs. Early on in this blog I did a post about a video mentor of mine Red Burns. I got a big kick when that post somehow appeared on her radar and she made a sweet, memorable comment (below). Red passed away in August 2013 and I was lucky enough to attend the NYU memorial for her this Fall. I’ll provide some links here to obits, tributes and memorials…. both written & video, but first Red in her own words. In the early video era of the 1970’s I met many people who I thought would change the world, Red was one of them… but she was one of the few who *did* change the world. I always felt that you could draw a line between the porta-pak era and YouTube, maybe more so than anyone else her life was that line. The tributes from the memorial do a better job describing her than I can. It really struck me what a powerful impact one life could have on others and all the odds and adversities she overcame along the way. She had this a vision that both humanitarian and down to earth… not blue sky. One person said a good motto for her would be “Chutzpah in service of humanity.” In operating in and shaping the digital media world, she never put the techie cart before the horse or trafficked in techno-buzz double-speak. She did so much with her life and I was very lucky to have been in her orbit. Tributes and remembrances from the Red Burns Memorial. In her post Red references a “band of angels” – this was almost entirely a group of her NYU students I worked with at (then) Manhattan Cable’s Public Access Dept. in the mid-70’s. She “caste” this group, and I am remain connected to them till this day. This group became Metropolis Video went on to be among the first to videotape bands at CBGB’s. It’s a funky photo but that is my dear friend Pat looking at Red Burns with great affection at the ITP 30th Anniversary Celebration! October 2009 that honored Red. 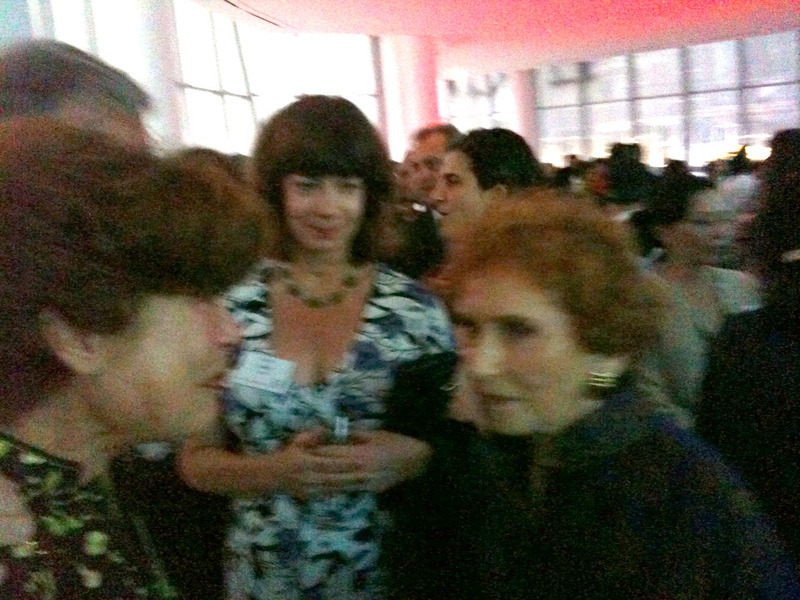 Her expression well captures our shared feeling toward this Icon who mentored us. Effectively buried for years “Hansel and Gretel” finally resurfaced in 2009, at the Museum of Modern Art’s exhibit “Tim Burton.” It’s now at LACMA, running continuously in the galleries. 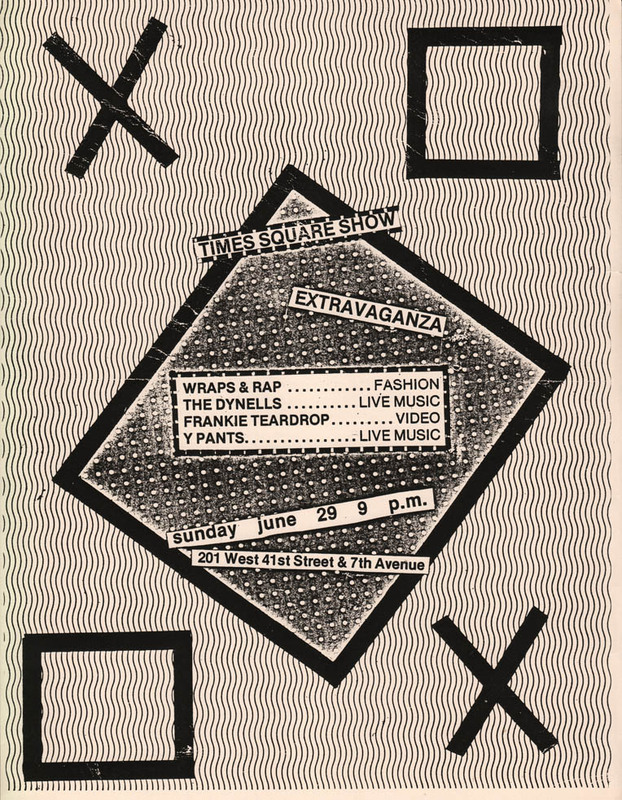 I’m pleased about the new exposure because I edited this film in 1983 (on videotape). It was made for Disney Cable and the powers-that-be decided to air it *once* on Halloween night 1983. 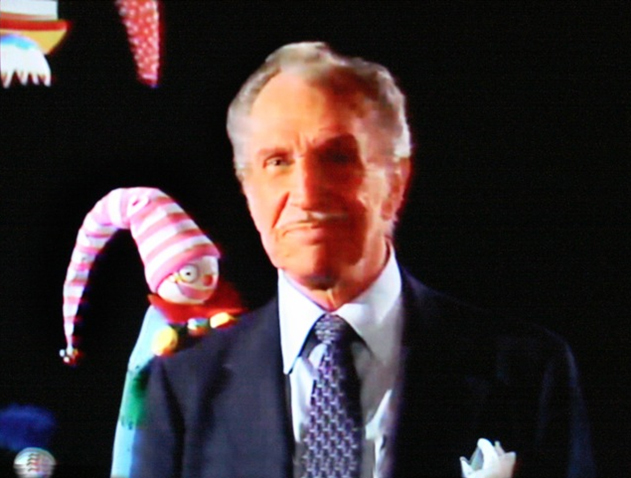 I found this screen grab on-line of Vincent Price’s introduction — fitting because Tim’s short “Vincent” aired alongside “Hansel and Gretel.” to fill one hour of air time. My college friend Henry Selick (best known as director of “Coraline” and “Nightmare Before Christmas”) had worked with Tim as an animator at Disney. Burton had already made his amazing animated short “Vincent” and there was an aura around him. H&G was a budget production, and I believe that everyone pulled together and worked free or cheap. Henry suggested me as an editor. I was based in NYC and ready for adventure in LA, but I didn’t know how to drive. 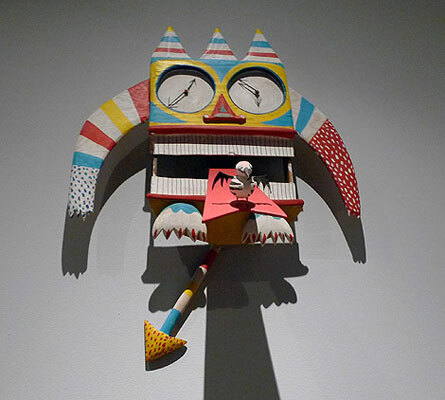 (I was 29 and a real native New Yorker:) I did a crash course and the ink on my driver’s license was still wet when I boarded the flight to L.A.
I’m pretty sure Rick Heinrichs, who was Tim’s partner at the time, designed this clock and most of the other props in their Pasadena studio. It captures the vibe of the film design. On arrival I met Tim’s partner and creative collaborator Rick Heinrichs. We went for a seaside walk with Henry (photos below) to get acquainted. The project had a charmed feel and was smoothly run. I guess Henry suggested me because I was young, would probably ‘get’ Tim’s sensibility and most importantly, I was an experienced CMX editor. Experience is a relative thing because in NYC, few knew how to use “trace” software required in sophisticated tape off-line edits in the days when one had to copy parts of edit v1 to make revision 1 and so on. I would come to master trace software in later years but lack of that skill didn’t seem to matter because the film was tightly storyboarded and Tim knew exactly what he wanted. We nailed the edit in one pass and everyone was happy. One happy dividend of my involvement was the fact that H&G was shot in white limbo, which inspired me to shoot a music video that year in black limbo – that was Rap Machine by Whodini. Shooting in limbo is very efficient in a budget production. For that reason it was one of the one few videos I directed that I feel like I really finished shooting: on the others we just ran out of time and had to fudge the edit. Things came full circle when Tim came to NYC on a business trip and I screened the music video for him— he really seemed to enjoy it. Finally the most fortuitous aspect of “Hansel and Gretel” was that when Pee-wee’s Playhouse (TV series) was looking for an editor, I understand that Tim vouched for me, (thanks pal:) and that cinched my being hired. This was a big break for me. Jaime Davidovich was the prime mover behind Cable Soho (aka Soho TV), launched around 1976. This video describes its ambitions and the articles below contain critical reviews of its progress. I don’t remember to what extent I edited this video, but that is my narration so I was involved some capacity. I better remember going around to interview the people in this video, working with Jaime and my friend Pat Ivers. Interviewees include Robert (Bob) Stearns of the Kitchen, Shridar Bapat (RIP) of Anthology Film Archives and artists Laurie Anderson & Maxi Cohen. In the open we see English poet Max Blagg as part of a lovely time capsule of a Soho weekend in the 70s. That is Bob Mariano my Manhattan Cable boss & mentor reading the mission statement. Bob was a colleague of Red Burns from the Alternate Media Center, who then became Director of Public Access. For more about that scene read this interview with Andy Mann. For more about Jaime, his efforts and some context – I provide some links. John O’Connor, the other by James Wolcott. Click to read them. Soho Television in New York Magazine with photo of Julia Heyward. I’m glad I found this from New York Magazine. It shows that the Soho Television series had some crossover potential and who better to feature in this context than the very talented and photogenic Julia Heyward. *My volunteering was richly rewarded when Jaime introduced me to his neighbors on Wooster St. – Edit deAk and Walter Robinson of Art Rite. 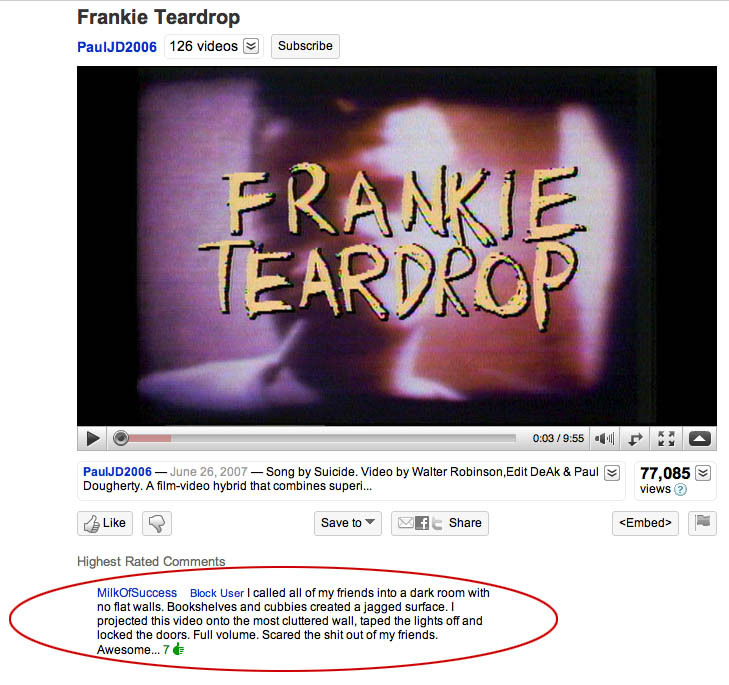 They had started work on Frankie Teardrop as a live manipulated, multi-projector film, Jaime wanted to get in on his series. FT evolved into an early music video of the Suicide song, now up at the MoMA. A very fortuitous introduction that resulted in a collaboration and a program for Soho Television in 1979. The half-hour slot was filled out with a 1975 performance of the Heartbreakers with Richard Hell. I live-directed this 3 camera video at CBGBs with my collaborators from Metropolis Video – I’ll that story for another time. I was hired by Tommy Boy to put this video together for a Planet Rock re-release in April 1992. Using bits of the original performance video by Danny Cornyetz & Jessica Jason, I intercut (great!) vintage hip-hop footage licensed from Michael Holman. I see the song first came out April 17, 1982 so now see that Tommy Boy’s re-release and commission to update the music video would commemorate the 10th year anniversary. If you want to figure out the provenance-pedigree of the footage Michael Holman’s web site. Besides the Bronx, I see some was shot at at breakdance competition at Lincoln Center (pretty sure I was there). Also the studio shoot with the white-graf backdrop was probably Manhattan where I see the very cute Debi-Deb (aka Debi Mazar) and the zany fun-filled Kano of the LES. After a couple of ‘industry’ posts, this from the indie side of the fence. I’m very proud to have been part of this show* and was in attendance that night, there was something in the air. No wonder the Times Square Show has entered into NYC mythology. *Song by Suicide. Video by Walter Robinson,Edit DeAk & Paul Dougherty. A film-video hybrid that combines superimposed projector manipulations and high-end video post-production, finished in 1978. 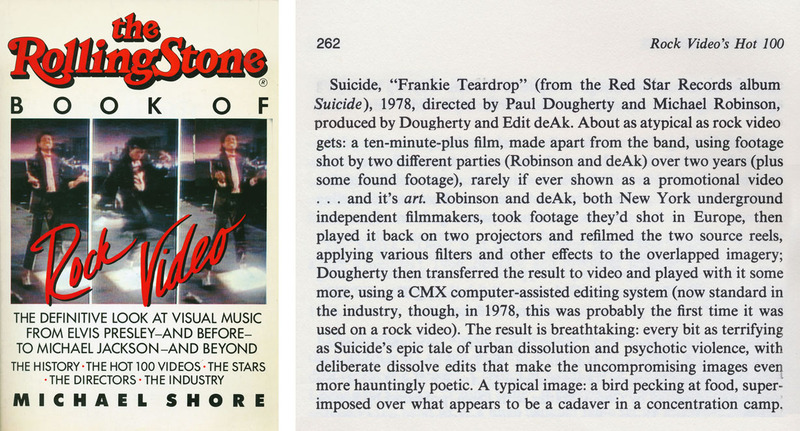 Rolling Stone’s “Book of Rock Video” Top 100.